The Dodgers avoided being swept by the Colorado Rockies this weekend, and steamrolled their way to a 6-4 win with a raucous eighth inning rally that began when the resurgent Matt Kemp blasted a solo home run to center field. The Dodgers faithful turned out on a hot afternoon, and the boys did not disappoint. They scratched and eeked out four small-ball runs, but it was only enough to tie the Rockies, who had shut down the home run blasting Dodgers during the first two games of the series. Ross Stripling took the mound today and gave up all four of the Rockies runs, but the Dodgers fought back and kept the game close with single runs in the first and third innings and two more in the fifth. 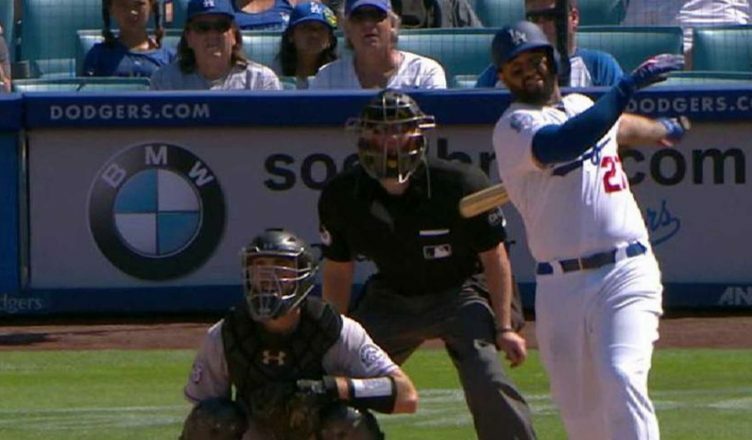 Matt Kemp had a grand day with four RBIs, which he picked up in the first, third, fifth, and again in the eighth with his tie-breaking home run. Max Muncy was on base all four times and scored two runs, but Yasiel Puig stole the show with a heads up play to score an insurance run in the eighth. Joc Pederson singled down the RF line, and when the Rockies bobbled the ball, Puig dashed for home, sliding head first (just like his Puigy Bank pose) just under the tag to put the Dodgers up by two. Kenley Jansen finished off the Rocks one, two, three, with two Ks for his 22nd save of the season. Next up for the Dodgers: The Pirates come to town for a three-game series starting tomorrow night. Kemp breaks out of his slump and they come from behind, Lakers sign Lebron and it is a good day to be an LA fan. You know, I was thinking about Kemp and his season, so far. There is no doubt that he has been instrumental in righting this ship and leading the team out of its tailspin. But his low WAR was puzzling to me so I checked through the stats to see what I could come up with. Taylor and Muncy have the highest WAR on the team with 2.4, 2.2 respectively. Kemp’s is 1. This didn’t make sense to me that his would be so small. Then I checked OBP for players batting over .300 and Kemp’s is significantly lower than almost every player’s at .348 who have over a 2. WAR. Then I checked BB and there I found the most telling stat, only 16BB’s. Kemp does not walk very much, but his OBP at .348 is nothing to sneeze at and the walks lower his WAR. His OPS is .889, not elite but damned good. He’s got power and hits well, but he’s not elite. That shouldn’t surprise anyone. Of course, we have to look at the team as a whole and consider the contributions of all players to assess a team. But arguably, at this point, Muncy looks like a rising superstar, of course in stats only. This guy has had a huge impact on the team. While Kemp carried the team early on, Muncy spurred them on to where they are now, much the same as Turner did last season along with Taylor, who still looks very good by the numbers. But we need another bat to offset the struggles of some of our other players. Numerically, many of our regular players do not measure up to high standards. If FAZ is a metrics junkie, many of our players are failing in the main areas of metrics calculations. Why does FAZ stick with them? It’s got to be the money issues, many of them come on the cheap. Not Forsythe, though. This could be a key replacement that could cement the team for the next few years. Surely, they must see this. Jeff, figuring why WAR numbers are what they are has to be something of an inexact science. I’ve come to the conclusion that dWAR is mercurial and adding it to oWAR makes no sense. Take Kemp for example, at BR his total WAR is 1.3, his oWAR is 1.8 and his dWAR is -0.8. Two things about that don’t add up. Obviously the numbers don’t, but neither does Kemp having a negative dWAR. I’ve seen most of the games and it’s my opinion he’s pretty good out there. I don’t know how they figure it at fangraphs. Over there Kemp has a WAR of 1.7 and his defense is given a -3.8, offense 11.2 with no real explanation of what those numbers actually represent. Kemp has been exceptional, and though I don’t expect him to finish like he started, which would mean he’d finish with 3.4 fWAR, I do expect him to more than earn the $18 million we are payuhim, something that I know FAZ was not anticipating. Admittedly I know very little about Sabermetrics but to look at their numbers on Kemp, if you did not know better you would think he offers very little but we both know he has played over a half season with great numbers. Wouldn’t that suggest to you that the numbers are flawed? If you look at the numbers traditionally you would think that he is near the top of MLB in hitting and defensively he is not bad. He has just one error this year and I have seen him make a number of good plays. Anyway, I guess I just do not understand the new numbers game but I know he has played well this year so far. I’m with you on that pack. I’ve been doing a lot of reading the last few years in an attempt to wrap my head around how sabermetrics works, for no other reason than to have a basic understanding of what it is my organization now values. Some of it makes sense. I’ve been an “on base” guy since Little League. I also value slugging %, so OPS makes sense. I don’t get dWAR. My philosophy for over 50 years has been you take the outs they give you and steal one whenever you can and you will end the game with more innings played than your opponent. Give me 10 innings and you can have 8 innings and I’ll beat you 7 out of 10. It’s worked for me personally, in playing and in coaching. I don’t agree with how catchers are valued and I don’t understand how Kemp has been valued defensively over the years. He wins Gold Gloves as a centerfielder yet gets negative dWAR in the process. Makes no sense to me. They talk about Gold Gloves as it means something but they can’t explain Kemp. All I really know is that the team I’ve rooted for since 1959 plays a very strange brand of baseball. They have the stars, but not like the Yankees stars. They have the ballers, but not like the Astros ballers. Dodgers play all or nothing baseball. When they hit 7 home runs it’s exciting, but the home runs are mostly solo so we win the game by 1 run. Frankly if we are going to win by one I’d rather see a single, get him over get him in brand of baseball. But that’s just me. I am a dinosaur trying to live in a metropolitan world. I’m working to adjust but it ain’t easy. They also don’t have the WS trophies that the Yankees do and probably won’t considering the brand of baseball they play. They rarely have top stars but when they do, they usually don’t last long. It’s hard to understand what kind of influence the Dodgers are under. The come from a very emotional fanbase, Brooklyn, and that has seemed to work some kind of charisma on them, but we are a dying breed and that will change as the years roll by. They won’t have the connections to the past that we as old timers bring with us. That might not be a bad thing. So far, FAZ are not working with the old blueprint. We don’t know how all this will develop. From our ‘old’ points of view, it’s impossible to be sympathetic to them but this may be a beginning of a whole new approach in Dodgerland. They’ve been on top the last 4 years and we all are scratching our heads and asking how? We all feel fooled or jilted in a sense. We are not getting a familiar product to munch on. It galls us, yet they are a competitive club. They were competitive with Colletti pulling the strings under the bewildering ownership of McFuknuts. FAZ hasn’t really improved on that, though a loss in the World Series is considered by some a significant meliorism. I started this year thinking we could get there again but my confidence in that outcome is waning. I’m not even sure we can win the West. I think it depends on who on our roster is left standing in September. We hit a lot of home runs but this team top to bottom looks weak physically. I keep waiting for the next injury and think it’s likely to happen on those Happy Gilmore swings I see at bat after bat. I scroinge my pleziasticus muscle just watching. Every player we have looks like a DL candidate to me. The Rams and Lakers look pretty good though. So, we got that going for us. Kemp had the highest War on this team for almost from the very beginning of the season up until his slump, and really he wasn’t in a slump that long, as compared to everyone else on this team. So Kemp had the highest War on this team, for almost two in a half months, or less. The other players that have a higher War then Kemp right now, was mostly from what they did at the beginning on June, so they have not played at that level that long, while Kemp has been the guy, for most of the season. In baseball numbers can change very quickly, even in a couple weeks, before June second, Joc was hitting 244 and his slugging was not even in the 400s, but he got so hot, that his average and his slugging went up very quickly in about 6 games. And lot of our other hitters also got hot when Joc did, although Joc was scorching hot compared to most of the players. And that is why some players War is higher now, and some of the other players defensive metrics are helping them have a higher War then Kemp too, because Kemp is just adequate on defense. Although Muncy is not a top defensive player, his defensive metrics have not been that bad. Muncy himself, has been pretty consistent, especially since this would probably be the longest time he has played consistently, in the majors. Taylor and Cody are probably our most athletic and better defensive players on this team, although Taylor is not a top shortstop defensively, his numbers are not that bad. And they get some of their War from their defense, and Cody probably gets some war from his base running too. But my point is most of these players that have a higher War then Kemp now, probably won’t have a War that high for as long as Kemp did. And now that it looks like Kemp might be out of his slump, his War numbers will be going up. It is very hard for any player to perform that well for a very long time, only a few players in all of baseball, can keep their numbers at an elite level for most of the season. And even the elite players will have times when they are not at the top of their game, because baseball has such a long season. Good points. We will see how it plays out throughout the year and who winds up the high WAR and OPS. We need Turner to turn the corner as he has been doing the last couple of years. Without him, the Dodgers are not the same team. I believe he is even more important than Kemp. Big upgrade for the Lakers, no doubt. Warriors will still kick them to the curb. Rams are another story. They really look good and should be a contender. We’ll see. I’m still a Bay Area fan except for the Giants. Could never get behind them. It’s those Brooklyn days. I’m a Warriors fan. giants and 9ers – no. Lakers still have some work to do. James is in LA for $ reasons. May or may not include championship basketball, but the team is relevant again. The Dodgers just don’t look like a championship team without Kershaw in Cy Young form and no Seager on the field. They miss both those stars. Sure, Kershaw is still out there, sometimes, but it’s different now. I am waiting for the Muncy ballon to return to earth. So far, it’s still in the clouds. Looks good up there. Ride it til it’s grounded. Anybody seen Barnes or Grandal? Combine their averages and the are hitting over .400. Grandal got lucky on his hit yesterday. He looked at strike 3 but it wasn’t called. We signed another top catcher. This one from Venezuela. I totally agree with you about Turner, he is truly our best bat in the line up, when he is himself, because he can do so many things, with the bat. And by the way I just saw this, Matt Kemp even after that small slump, still has the second best OPS of all outfielders, in the National League, and that includes Bryce Harper. Report on MLB.com that the Dodgers are talking to the Marlins about their relief pitchers.. I wonder if they would be interested in Toles. Or Verdugo. Or both, if the team throws in Forsythe? Take Forsythe and we can throw in Toles … and Mitchell White. The guy they are targeting is Barraclough. And according to sources the price is pretty high, but he is under team control until 2022. With Corey out, and Turner not quite the hitter he normally is, we have a team of average hitters, that have pop, except Kemp. Kemp is the only player on this team, that has been hitting 300 since the beginning of the season. It is harder for our offense to be productive, when we are missing two of our best hitters. But because we have a bunch of average hitters on this team, I still think our hitters, should still to the little things, and make the offense more productive, because they have major problems getting hits, when runners are in scoring position. The weak hitters on baseball teams before this saber metrics, could still do the little things, to make the offense more productive, and so can the players we have now, if it is emphasized by the management. And they also can still win games with HRs too, there is more then one way to score runs. We rank quite low in batting average, and I know some think that is not a big deal, but that is probably why we have so much trouble getting hits, when runners are in scoring position. And because we have trouble getting hits when runners are in scoring position, if our players would try to be more productive on offense, they could score runs, without even getting a hit at times, if the players as a team, have productive at bats. Since we won that game off the Rockies terrible pen, we should also get better against the Pirates in this next series too, but you never know, because the Rockies obviously made adjustments since we last played them, and the Pirates probably have too, but they are not a good team. OPS is more important than batting average. We are 7th in that stat. 11th in runs. Yankees 1st in OPS, Boston 1st in runs. Cubs lead NL in scoring. Cubs lead NL in OPS too. Cubs are good. Their pitching is better and they score more runs. Maybe that’s why they are the current NL favorite to make the WS. I know that, but batting averages are still important. And as you know, their are plenty of players, that can do both! Why settle for mediocrity, when you can have both? I know the Red Sox top two players are providing both, and I am sure if I looked at the Astros numbers, I could find at least two of their players, that are doing both, too. Averages are important to old fans. Old fans like you and me MJ. What is more important to management today is OPS. In one of the Dodgers articles today, in the LA Times, they mentioned what Toles has been doing with the bat lately, although they didn’t get Toles numbers exactly right, but obviously the Times thought Toles performance lately, was news worthy. And Toles was two for four, in four at bats yesterday, and his two hits were a double and a HR. He has now been 14 for 22, in his last 22 at bats. And he is now batting 352, and his OPS is in the 900s now too. Again, there are fortyleven players ahead of him on the depth chart. I’m happy he’s banging AAA pitching, but I have to ask – what’s the plan for him? 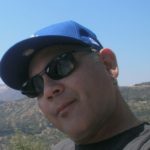 If the Dodgers were to bring up a left handed outfielder, wouldn’t it be Verdugo? Not necessarily, because Toles is higher on the depth chart, then Verdugo. The only reason Verdugo was brought up after Puig went out, was because Toles was dealing with his hammy. Toles not only has hit with more power then Verdugo, he is more proven then Verdugo at the major league level, and he has something that only Puig has, in the outfield, and that is speed. And I am not saying bring him up today, but if this team continues to not produce on offense, there will be moves. And remember he was our regular leftfielder last year, and he was hitting well, right before he injured his knee. And he was able to show he can produce not only last year, he produced when first came up in 2016 at the end of July, after starting in A ball that year. And he was still hitting in the post season, at the end of that year. As you know, you never know what is going to happen in the long baseball season, and we have a ways to go until the season is over. How do you know Toles “is higher” than Verdugo in the eyes of the Front Office? Is it again putting your opinion out there as fact? I hope not. Badger, this is the mystery we’ve been trying to solve for the past 2 seasons. Every time Toles makes it up to L.A., he gets hurt, and the carousel begins again. What to do? Trade him. Trade somebody Jeff. We have no room for him. Does he have trade value? Frankly I doubt it. It appears he’s strictly LH outfield depth. He’s there in case Pederson fails. Well, Joc isn’t failing. It’s a tough situation for Toles, but Miami may be a good spot for him to land. We won’t get Barraclough for him, but he could be a throw in on some deal. I doubt that too though. No need to do anything but keep him where he is just in case, though it’s my opinion Verdugo would be first choice in an emergency. I could be wrong about that. We have 3 ML ready LH outfielders. There has to be a team that needs one, right? If Toles gets injured as often as you say, which I don’t believe, then he won’t have much value in a trade. I am not big on WAR, but how in that heck, does Stripling have no value in WAR? He has a 2.7 WAR on BR, that’s no value? Damm. It does sound serious. But it’s Guggenheim. Aren’t moves like this what is expected of them? Look at Fangraphs Dodgers stats, they list Stripling’s War there is – 0.1. And they list Toles above Verdugo on the depth chart there. Who was the last outfielder sent down after spring training, Toles. Who did Friedman draft, and who has more major league time? And publicly it was said, that Toles would be the first one brought up, after spring training. I was looking at team hitting, and that is where I saw that value for Striping, I thought that had to be wrong. I thought it was just every players War numbers there, because I didn’t go down to the pitching category. And where did I even say that Toles is higher in the front office’s minds, I said on the depth chart, which I saw on Fangraphs. Yes, I’m not sure we should assume that FanGraphs editors are thinking like the Dodgers Front Office. I never said the front office, that was your words. But if we are talking about who would be the first up, if an outfielder was needed, why would you think any differently? But I have noticed through the years, that they will bring up a player that has played on the major league team successfully, over another player that hasn’t yet. And even if the player that has played successfully on the major league team before, they will still bring up that player, even if their numbers are not great at AAA. Remember what they did with Trayce Thompson when he had that terrible year at AAA? What makes you think any differently, I have far more reasons to think what I said. You explicitly said that Toles was ahead of Joc on the depth chart. Who controls the Dodgers depth chart if not the Front Office. Here’s a tip, stop saying things that aren’t accurate. Toles came up in July of the 2016 season, all the way from A ball, and he produced all though the post season. Check his numbers for the post season that year. He only got hurt last year. And both Puig and Joc have went out on the DL more. Your argument is moot. Minor leaguers are not listed on the teams depth chart. So no one knows where the FO rates either player, but logic says that Verdugo is rated higher than Toles simply because he is their #1 prospect and Toles is not on that list. Just exactly where he stands as of today with the front office is known only by them.